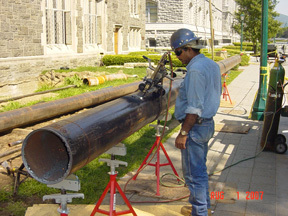 Title : Steam Line Replacement in Central Area, USMA, West Point, N.Y. 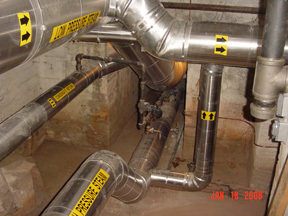 Replaced 2700 L.F. of high pressure, low pressure steam and condensate return lines. 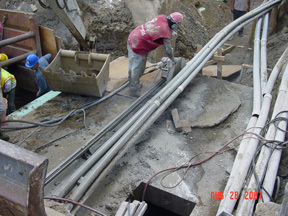 Manholes were gutted and rebuilt with all new piping. 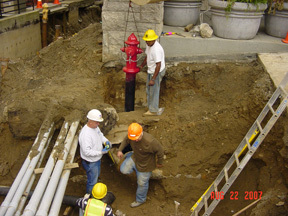 Work also included wet tap and replacing 20' of 6'' water main and new fire hydrant, and installing new 2'' and 3'' gas lines. 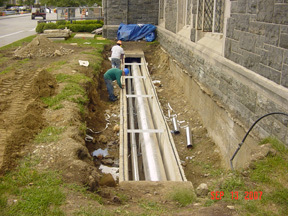 Direct buried steam lines were pre-insulated. 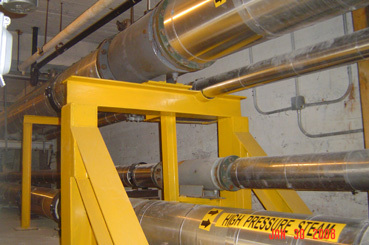 All welds were x-rayed. 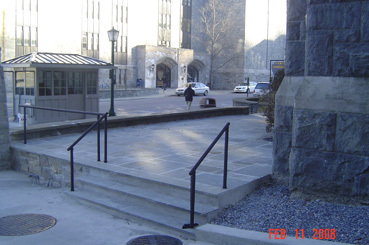 Site restoration involved truck ramp 12'' 4000psi concrete with double mat # 6 rebar, blue stone entrance way, stone retaining walls, and hand rails. Removing top of tunnel in front of Building 602 in order to replace steam lines. 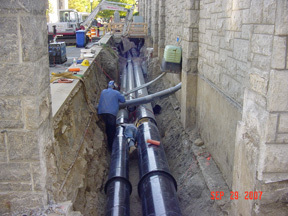 Removing existing steam lines in tunnel at Grant Hall. 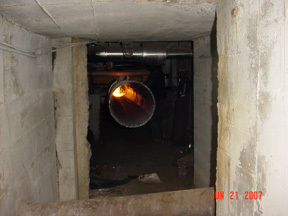 Fabricating new pipe for tunnel at Grant Hall. Open excavation at south ramp beside Building 740. 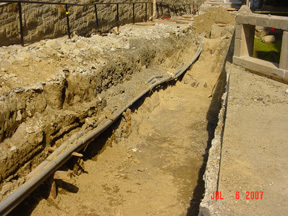 Trenching at south ramp and Building 606. Saw cutting to remove roof of manhole F3. 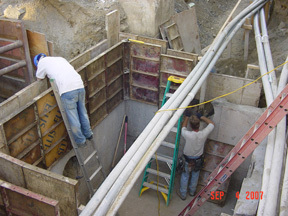 Raising walls and new ceiling for manhole F3. 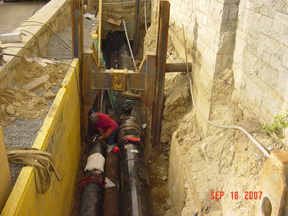 Installing all new piping and expansion joints in manhole F1, F3, F4 and F5. 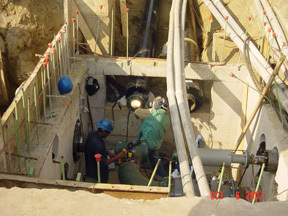 Placing direct buried steam pipe in trench in front of Building 740. 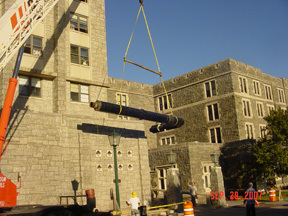 Placing new steam lines in front of Building 740. Placing new steam lines in front of Building 740. 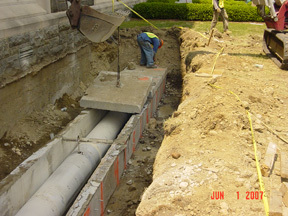 Installing new gas line, water main and fire hydrant at Building 738. 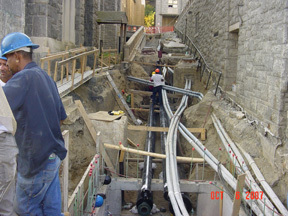 Newly installed piping in tunnel at Grant Hall, bldg 602. Piping in tunnel at Grant Hall. Piping in tunnel at Grant Hall. 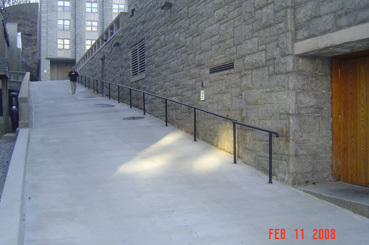 New concrete at south ramp. 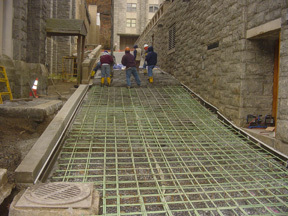 12'' 4000psi concrete with double mat rebar.